Production of domestic livestock on the public land in the U. S. (Forest Service and BLM) is reducing and killing water flows in the arid West, promoting desertification that contributes to global warming, and destroys habitat for species like the sage grouse and pygmy rabbit. See http://www.westernwatersheds.org . Obama made a disastrous choice picking Colorado rancher Ken Salazar to head BLM the Department of Interior. To change the ecological disaster of public lands grazing, Salazar needs to be removed, and a competent person without bias towards the meat industry put in place. Data from the World Resources Institute’s CAIT 4.0 database (registration required). Includes CO2 emitted up to the year 2000 only (not CH4, N20, PFCs, HFCs or SF6). Estimates of the effects of land-use change are included; bunker-fuel emissions are not. The scale is a 0-100 decay-weighted index. You are simply perpetuating FAO data which has been twisted and spun for the purposes of ‘shock and awe’ type media presentation to further the goals of the FAO. Livestock contribute 11.5% of all GHG, per the FAO’s own data, and everyone should take the time to actually read their reports, especially ‘Livestock’s Long Shadow.’ Included in that 11.5% is carbon dioxide emissions from the cropping of animal feed crops, which will increase if the FAO succeeds in intensifying the production of livestock. Also included in the actual 11.5% are Nitrous oxide emissions at 5.5%, and methane emissions at 5.5%, per the FAO, from the livestock sector. Most of the nitrous oxide is from manure in intensified feedlot livestock production. The mighty FAO doesn’t ever spend much more than a paragraph in that regard — instead, they constantly tell the world that livestock grazing on grass are inefficient animals, yet their footprint is much smaller than livestock on feed in a bunk. The FAO incorrectly, and with the intent to confuse and defraud their international audience, includes their estimations of CO2 emissions from deforestation and land use changes. They readily admit it is a ball park estimate and that it is not clear whether a lot of that is actually for human food cropping. For certain, it was necessary for the FAO to include the CO2 from deforestation in order to get their ‘shock and awe’ figure of 18% and thus claim livestock contribute more than transport to climate change. More importantly, your FAO does not bother to reduce this CO2 emission footprint from deforestation, by anything other than a token amount, for the comparable carbon sequestration of this planet’s grasslands that are the result of that deforestation. As for the epidemic of obesity — it is a ludicrous notion that obesity is due to animal fat and protein, just plain nonsense. Obesity is directly due to excessive carbohydrate intake, processed carbs, not processed meat, and that’s processed carbs and grains with a much bigger C02 footprint than the meat from an animal will ever have. And as for the USA being the biggest culprit in GHG emissions from livestock, it just is not the case, per the FAO’s own data. The biggest contribution made by US livestock production is via nitrous oxide in feedlots, and even considering that, our contribution is immaterial compared to developing countries. 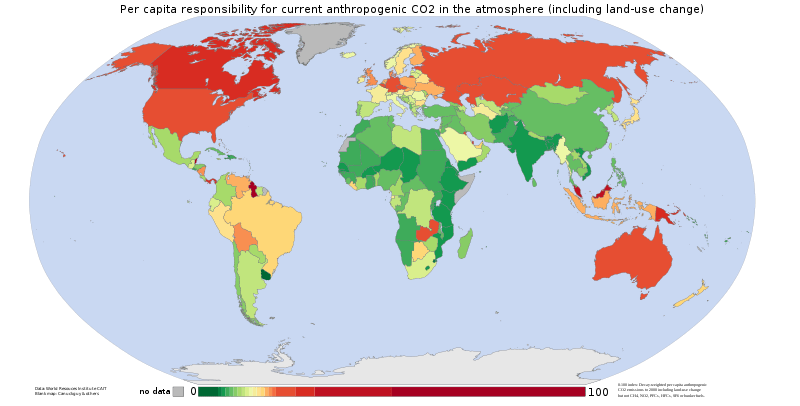 Further, the nitrous oxide from untreated human waste in countries such as India with HUGE populations, far and away exceeds the emissions of livestock in this country combined with several others, of that I have no doubt. Human waste containment and use as a fertilizer would solve most of the global problems of food production and global warming. Apparently, it is a distasteful topic for the highbrow UN climate scientists.